1. Healthy night in with my boyfriend... I love comic book films! 2. Cookies I made ( I'm going to do a blog post on how to make these soon) 3. 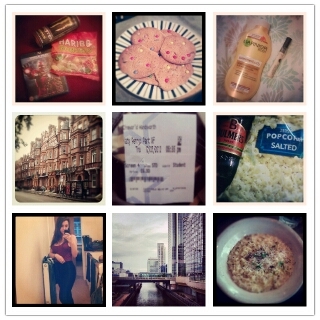 By purchases from Boots, I'm seriously impressed with the Garnier Body moisturizer 4.Sloane Square 5.My cinema ticket to Katy Perry's new film 6.My favourite treats after working lots of long shifts at work! 7. I finally got Disco Pants in black & I love them! 8 & 9. I went out for dinner to Jamie's Italian in Canary Wharf with my two gal pals Liv & Gemma and had the truffle risotto.